News that the White House had ordered the Pentagon to draw up plans for a troop withdrawal from Afghanistan provoked widespread criticism that the move would kneecap efforts to broker a peace deal to end America’s longest war. Senior members told NBC News the news was a clear indication they were on the verge of victory. “We are close to our destination,” added the commander, who spoke on condition of anonymity because the group’s leadership had prohibited members from talking to the media about current events. He added that all field commanders had also been told to intensify training efforts to capture four strategic provinces in the run up to the next round of talks between the U.S. and Taliban, which are expected in January. A Taliban leader in eastern Kunar province, Maulvi Sher Mohammad, said news of withdrawals should serve as a lesson to Americans. “The U.S. people and particularly its rulers should think about what they achieved by invading Afghanistan and by causing so many losses to the citizens of Afghanistan and wasting their own resources on this long war,” he said. The Pentagon declined to comment on the Taliban’s claims. So far, the U.S.’s military campaign, along with billions in aid, have not succeeded in driving out the Taliban and other militants or making the country safe. In 2017, Afghanistan overtook Iraq to become the deadliest country for terrorism, with one-quarter of all such deaths worldwide happening there. And the number of civilians killed in the country reached a record in the first half of this year, with a surge in suicide attacks claimed by the Islamic State group, according to the United Nations. Despite years of fighting, only around 65 percent of the Afghan population lives in areas under government control. The U.S. plans for a withdrawal were due shortly after the new year, according to two defense officials and a person briefed on the matter. They cautioned that no decision has been made, but President Donald Trump wants to see options. The Taliban sheltered 9/11 mastermind Osama bin Laden and was toppled soon after the 2001 attacks. Since then, the militants have been trying to unseat the U.S.-backed government in Kabul and reimpose their strict version of Shariah. Successes on the battlefield coupled with a recent intensifying efforts to reach a peace deal led by U.S. envoy Zalmay Khalilzad have boosted the movement’s confidence and power. Khalilzad, a former U.S. ambassador to Iraq, Afghanistan and the United Nations, has stressed he is “in a hurry” to secure an agreement, a sign of how eager the White House is to withdraw the 15,000 American troops remaining in the country. But reducing the U.S. footprint in Afghanistan would mean fewer U.S. air bases, and American firepower will be “less responsive and less available” for Afghan troops fighting Taliban militants, said Jason Campbell, a former senior Defense Department official and now a policy researcher at the RAND Corp. think tank. Plans to scale back the U.S. military mission in Afghanistan comes after Washington pressed NATO allies this year to keep troops in the country, and some governments — including Britain — agreed to expand their contributions following an appeal from Defense Secretary James Mattis, who resigned on Thursday. 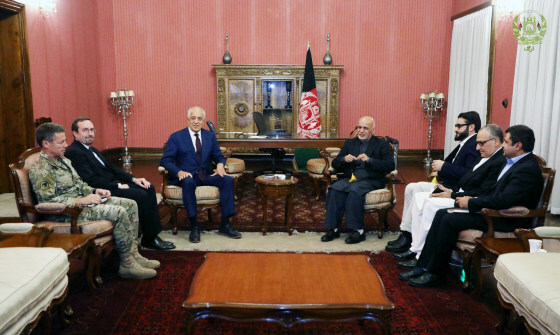 The news shocked and confused NATO allies and the Afghan government, at a moment when the United States is engaged in a major diplomatic push to try to launch peace negotiations. “The abruptness of this I think really hurts our credibility,” Campbell said. For Khalilzad, the move deprives him of his most effective point of leverage before negotiations even have begun in earnest, experts and former officials said. “It will have a devastating effect on peace negotiations,” said Seth Jones, a former adviser to the U.S. military now at the Center for Strategic and International Studies, a Washington think tank. Mushtaq Yusufzai reported from Peshawar, Pakistan, F. Brinley Bruton from London and Daniel DeLuce from Washington.